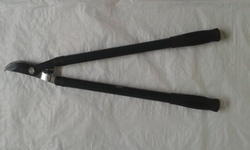 We offer Telescopic Pole Chain Saw. - Fast connecting device, convenient disassembly and assembly steps. - The two-section combination realizes smaller package to make it easy to transport and carry. - The machine has one engine and working rod with four working head, being more economic. The Mechanised Pruner with its extendable shaft can Trim Branches up to 5mtrs high standing on the ground. 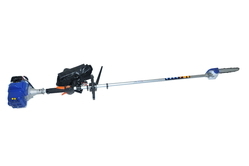 Powered by a petrol engine the Telescopic Pruner is ideal for use by Electric Linesmen, Orchard owners, Municipalities for pruning Tree branches along Avenues, Public Gardens, etc. When working in built-up areas or noise-sensitive environments, our electric pole pruner is particularly quiet.Because when it comes to maintaining orchards and thinning out shrubs and bushes, these tools are ideal for treetop work. Designed For Professionals and idela for pruning high and hard to reach branches.